The friendly lot where I’m plying my trade at the mo have just brought this lil’ beauty to my attention. And as it’s nearing the festive season, I thought I’d allow myself just one smidgen of puerile fun poking. No ‘arm Guv’nor – especially when the victim sprawling haplessly in the stocks has slyly slinked to get one over on their rivals. 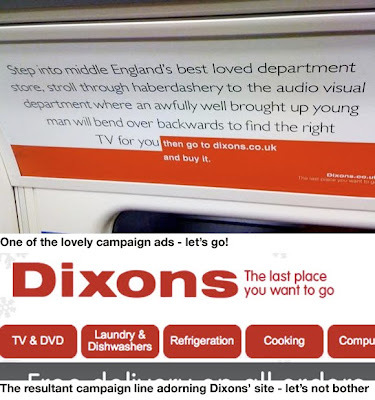 Throwing rotten cabbages and cocking a snook to the competition is electrical retailer, Dixons. Those with a keen eye for any recent marketing endeavours to prise our coins from our consumerist clutch may recall Dixons’ campaign attacking the likes of Harrods, John Lewis and Selfridges. Oh no, forget all that. Just remember that the campaign concept is a fairly age-old one of ‘Try everywhere else then come to us’; in other words you may as well come to Dixons last because you’ll see we’re cheaper. Fair enough; it’s not rocket science but its simplicity dictates that in most cases it should work. Unless you forget you can’t just roll out a campaign across all media without a jot of thought. Unless you forget that a campaign tagline must be in context for it to communicate what you actually want to say. Unless you’re in such a rush to get your shiny new pleased-as-punch strapline up on your website nestling next to your logo that you forget it would probably be more suited to a bagel fight in Baghdad sporting nothing but a ‘Bush is Brill’ t-shirt. Where the bloody hell are those GCSE’s when you need ‘em?